One of the most common window and door issues that comes up during a home inspection is fogged glass, more commonly known as a broken seal. For a nice description of exactly what causes a broken seal, head on over to the Family Handyman. Interestingly enough, identifying failed seals on insulated glass is something that is specifically excluded by home inspection standards of practice. Just in case you don't know what I'm talking about, check out the photo below. Two of these four window panes have badly fogged glass. When an insulated glass seal fails, there are three things you might see when looking through the glass: nothing different at all, condensation or dirty/hazy glass. When a seal initially fails, nothing dramatic happens, and there is no visible evidence of a failed seal. A desiccant around the perimeter of the glass unit will help to prevent moisture in the air from filling the space between the two pieces of glass. This will keep the glass looking just fine, at least for a while. This is why home inspection standards of practice exclude the identification of failed seals. There is oftentimes just no way to know. Given enough time, moist air begins to fill the space between the two formerly-sealed pieces of glass. When temperatures remain fairly constant, you won't notice this moisture in the glass. Only after there has been a fairly rapid change in temperature, either indoors or outdoors, will you see any evidence of a failed seal. This starts out as condensation between the two panes of glass. The photo below shows a nice example of a window on my own home that just this fall started showing evidence of a failed seal (lucky me). This window looks perfectly fine most of the time, but just a few weeks ago I noticed a nice little band of condensate between the pieces of glass. This condensate was only there for a few hours, and I haven't seen it show up again since, but I'm sure it will keep coming back more and more frequently, and the amount of condensate, or fog, will only grow. After this has happened enough times, a mineral deposit gets left on the glass, making it look dirty all the time, even when there is no condensate present. The photo below shows an example of another window in my house with some faint, annoying deposits. 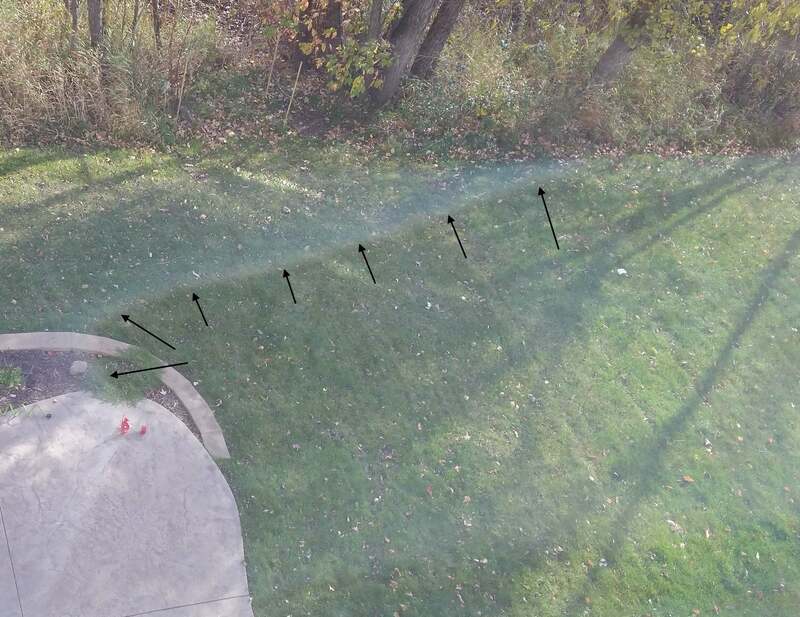 I added a few arrows to the image to highlight this area. 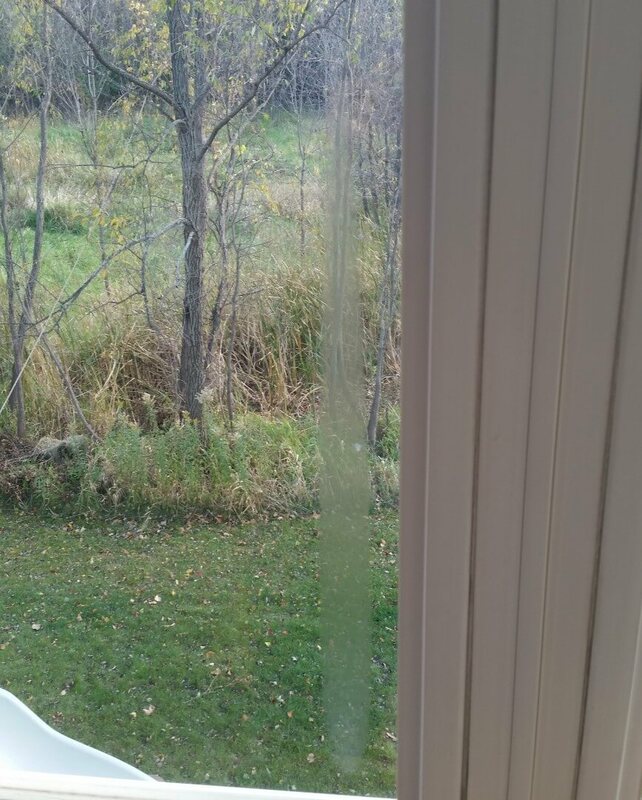 When insect screens are present or when the glass is dirty, fogged glass like this may not be visible. That's another reason home inspection standards of practice don't require identification of failed seals. When I inspect a home with numerous panes of fogged glass, I often tell my clients that while I may identify many locations of fogged glass, I'm probably not catching every one, especially if the windows aren't perfectly clean. 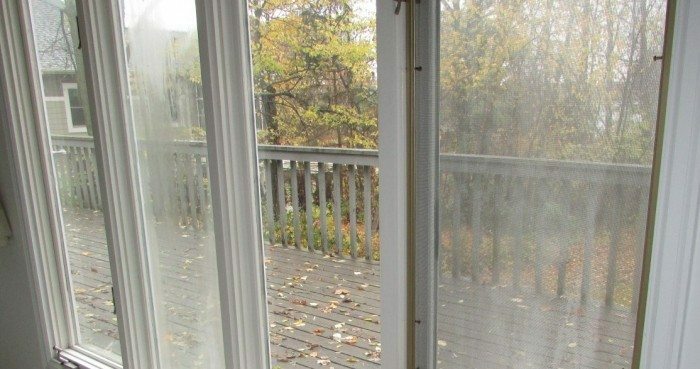 Once a window or door has had a failed seal for several years, the glass gets dirty enough to the point where it's completely obvious all the time, and it becomes quite bothersome to look through the fogged glass. I had a few panes of fogged glass at my house when I moved in, but that number has grown from a "few" to a "whole bunch" in the past several years. My wife and I couldn't take it any more, so we decided to have the windows repaired. I'll share the repair process in next week's blog post.